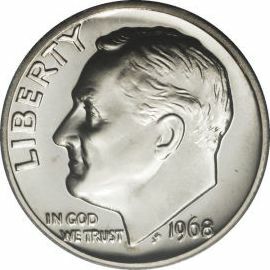 Roosevelt Dimes coined after 1965 are generally the same as the earlier silver issue. The main difference is not in design but rather composition. The US Government chose to change the composition from 90% silver and 10% copper to an alloy plating of 75% copper and 25% nickel bonded to a pure copper core. These coins are currently being made at the US Mint in large quantities for commerce. the date were at the base of the main design. President Roosevelt was selected to appear on the dime partly to honor him in his efforts through WWII, the Great Depression and his involvement with the "March of Dimes" fundraising campaign to end polio. The reverse shows an upright torch, symbolizing freedom, flanked by branches of olive and oak, respectively denoting peace and victory. The motto "E PLURIBUS UNUM" was awkwardly spaced between these elements in a single line. 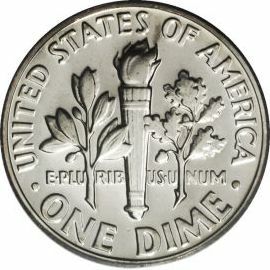 The inscriptions "UNITED STATES OF AMERICA" and "ONE DIME"